Win a NEW Beach Bum Babies print Thirsties OS AIO! 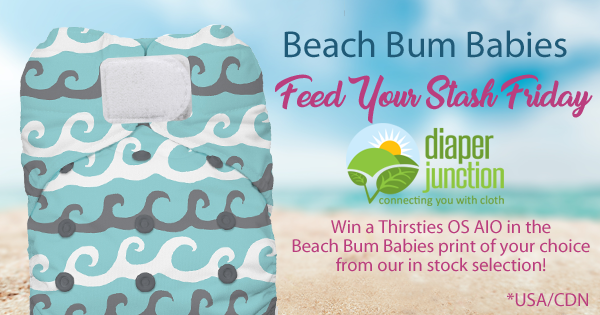 FYSF 6/16/17, Win a Thirsties OS AIO in a NEW Beach Bum Babies print! Have you seen Thirsties new Beach Bum Babies prints collection? These new prints are fun and aquatic themed, perfect for summer adventures! Our prize this week is your choice of ANY new Beach Bum Babies print One Size AIO from Thirsties! This One Size All in One reusable diaper, truly challenges the slim-fit and convenience of a disposable diaper. This diaper offers absorbency, waterproof protection, and adjustability all rolled up into a stylish, comfortable and extremely effective cloth diaper. The team at Thirsties thoughtfully designed this all in one diaper. The built-in, three-layer microfiber terry soaker absorbs an amazing seven times its weight in liquid. The soaker is topped with a stay-dry microfleece which keeps your baby feeling dry. An additional layer of terry lies between the microfleece and PUL body of the diaper providing a last line of defense. The soaker is sewn in on one side (at the top of the diaper), which makes adding extra absorbent layers a cinch and tremendously decreases drying time…it’s the fastest drying diaper Thirsties has ever created! Enter to win this week's giveaway using the Rafflecopter below. One lucky winner will receive their choice of ANY in stock Thirsties OS AIO! This giveaway is open to the USA & Canada. Must be 18 years or older. Winner will be notified by email and will have 7 days to reply and claim their prize. They are all cute but I would pick the Whales! These prints are PERFECT for summer and are so cute! I just bought a Thirsties AIO and it's not my favorite, but I do love the fit and prints! I want that surf print! So many cute prints! I like whales and beach party best! I would pick Beach Party!! :D So cute!! I love all the new prints!! But because I'm a sucker for moss and it has moss details I would choose the beach party print if I won! These are adorable. I'm loving whales! Such a cute print! Thirsties covers are my absolute favorites so I'd love to try an AIO! Loved the thirsties newborn natural aio on my son but he's now starting to grow out of them at 13 pounds. Would love to win the bigger aio and being a surfer would have to get the surf print! Love the beach print too! We love Thirsties Duo Wraps and are excited to discover its AIOs! We love Thirsties Duo Wraps and are excited to discover its AIOs. The new Whale pattern is absolutely ADORBS! Love Thirsties diapers - would be awesome to win in the new beach prints! I love the whales print! Such a cute lineup! Love beach party and the whales print! Great prints! I think Surf's Up is my favorite ?? Loving these new Thirsties prints! They're perfect for summer (and for making a little summer of our own when it's snowy out). Oh, and I don't have a favorite, but I think I'll get Surf's Up first! they are all super cute but the whales have my heart! I would love to have the NAIO in mountain bike. sooo cute!!! I love all things Thristies! I have a couple Thirsties AIOs and they work well, even on the lowest rise settings. Love the ocean prints! We are whales all the way here! I'm so excited about your products! Can't wait to try more! I love them all so much that I might have to get all three! Beach Party or Surfs Up! That's a tough one! I would pick "Surf's Up" bc it's gender neutral and super fun for summer. I might go with the whales diaper if I win, they are all so cute! I'd probably choose beach party or surfs up. I would have a beach party! Beach Party in a NAIO would be my choice. I love the dark charcoal background, & I hope it makes an appearance on future prints. Love the new prints! Thirsties are my fav ?? Love the whales print! So cute! Amazing giveaway! I've been wanting to try the natural AIO to review for my YouTube channel! Thank you for the great giveaway! I think fallen leaves looks neat. This is so perfect for summer!!! Thanks for the opportunity ?? I love the Surf's Up and Beach Party prints! They are perfect for summer :) Thanks for the opportunity! I like the whales print the best! I love the Surfs Up print!!! I love the whales the best but since I have a boy my second favorite is surf's up!